Having written over 600 posts to this blog, dear readers, you may think I do nothing but historical research. But no, in fact I also have another hobby which I will now reveal: Quilting. Although there is an excellent quilt store here in Skagway, open year round, Quilt Alaska, which is about 300 feet from my office, I actually specialize in antique quilts. Specifically, I do quilt rescue. I acquire old, barely recognizable antique quilt blocks and tops, and I tear them down to basic designs then I repair, clean and re-construct them. I recently invited 10 ladies to stay with us for the Buckwheat Ski race and suddenly wondered if I had enough bedding for them all. So I counted my completed quilts. Would you believe 50? And another 15 completed quilt tops, not counting the infamous “unfinished objects” in storage. After I finish the top, I put it together with natural cotton batting and back and then handquilt it, which takes up to 6 months. If it is not an antique quilt top, I sometimes machine quilt it, but I hate to do that. Anyway, I may photograph one someday and post it if anyone is interested. Some ladies who only buy new fabric must think I’m mad to use 100-150 year old fabric to make a quilt, but as I am fixing and finishing the project I think of the poor woman who started the quilt but for whatever reason never finished it. Did she run out of fabric, move and lose it, or die before she finished? We will never know, but the pattern and the tiny stitches often tell a story in themselves. I will enter one or two in the art show in April here in Skagway, with a story. Ok, that’s all for now…. – Seen above is my latest acquisition in its sorry state, which I have already redone, I will post the transition tomorrow. This photo taken by Draper in August 1911 says it is of “Indian Dave”. No other information. Built in Philadelphia, engine No. 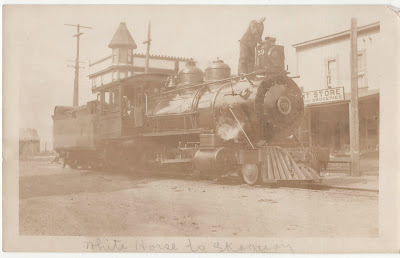 59 was a Baldwin 4-6-0 purchased new in 1900. This ten-wheeler had a long-boiler that had substantially more heating surface area. The grates and fireboxes were relatively small, however. It was scrapped in 1941. This photo of men working on the railroad line says Dedman Studio Skagway, but it looks like it is alongside the Yukon River with the Steamships. My guess it is Whitehorse, or possibly Carcross. Henry was born on this day, February 27, 1863 in Port Chalmers, New Zealand. His father John Darling founded the Union Steamship Company which ran steamships from New Zealand to Vancouver, later known as the Canadian Australian line. Henry was schooled in London and then apprenticed to John Gwynes, an engineer there. He then went to India and worked for the British India Steam Navigation Company and the British & Burmese Company of British India. In 1891 he came from Glasgow, Scotland, to British Columbia as the superintending engineer in charge of the building of three steamships for the Union Steamship Company. Around 1899 he became the general manager of the British Yukon Navigation Company, Ltd., organized by the White Pass & Yukon Route. By 1902 he and his family of four sons and two daughters, living in Vancouver, started their own business in wholesale paints, oils and varnishes. Henry Darling must have died in Vancouver April 6, 1926. The photo above was taken in 1925 and contributed by his great grandson Mark Darling. British Columbia. from the Earliest times to the present vol 4 1914.
some information and photo contributed by Mark Darling, 2018. For those of you interested in shipwrecks, here is a great site for finding what ship sank on this day in history! 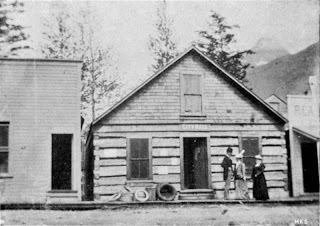 Seen above is the S.S. Cottage City in Skagway in 1900. 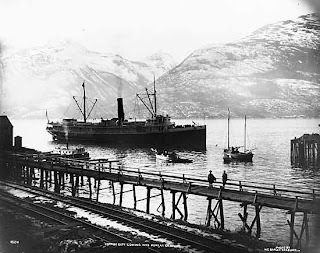 It later ran aground on January 26, 1911 in a blinding snowstorm and heavy fog off Quadra Island, Northern British Columbia. Equipped with a radio they were able to send for help and everyone survived but the wooden-hulled ship was lost. George E. Carson was born in 1846 in Maryland. He moved to Indiana where he met and married Matilda. They had two sons and a daughter there from 1876 to 1886. 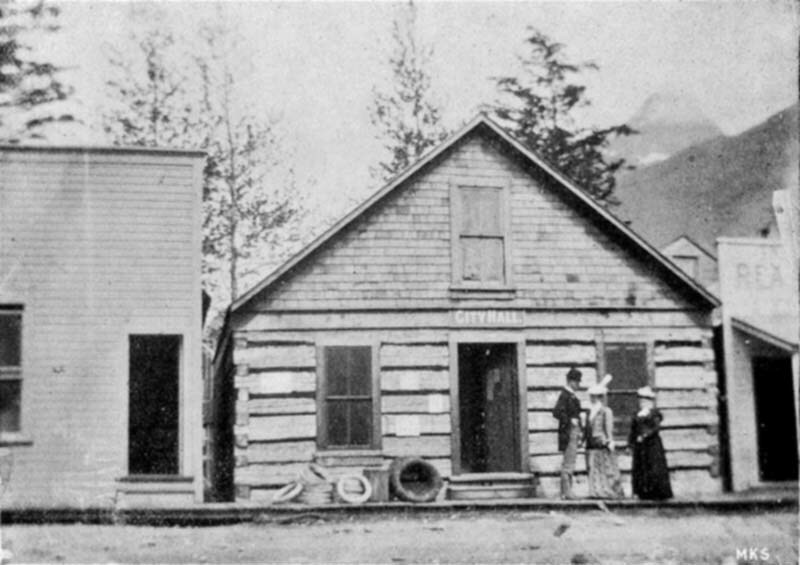 In 1898 they all moved to Skagway. In February 1898, as the U.S. Customs officer, he logged in five thousand stampeders. In Skagway and Dyea he had help from U.S. Customs officers William Denny, Lewis C. Harman, C.L. Hobart, I. Myre Hoffstad, J.W. Ivey, A.I. Jones, DeWitt P. Lea, L.S. Luke, Oliver McCulloch, Thomas G. Payne, William H. Robertson, W.H. StClair, Clarence Leroy Andrews, R.W. Bellman, and others in later years. Georg’s son, George C. also worked for U.S. Customs in Skagway in 1906 and the family stayed until George E. died on February 20, 1931 in Skagway. He is buried in the Pioneer Cemetery. Seen above is City Hall in Skagway, it is perhaps where the Customs had their office, but maybe not. The “Snow King” and the last spike. Charley Moriarity or Moriarty (otherwise known as the “Snow King”), was the head of the track-laying gang on the White Pass. He was a silent, red-headed Irishman and had a great capacity for working himself, and getting others to work. Many people have been given credit for putting in the last spike on the White Pass & Yukon Route Railroad at Carcross on Sunday, July 29, 1900. NWMP Inspector Begin was in Dyea in 1897. He was born on this day, February 15, 1856 in Quebec and spent several years working on steamboats on the St. Lawrence River and then served in the militia for three years before joining the NWMP in 1885. He served in several provinces before coming to the Yukon. In 1891 he married to Alexina Chartrand and in 1893 had a daughter, Renalde, and then two sons: Francoise Begin born in 1894, and Jean Berchmans Begin, born in 1897. His family must have lived in a larger community, not Dyea, certainly, judging from photos of the family. From here he went to South Africa and later served in the Great War – a euphemism for WW1 which was big but not all that great. In 1929 he moved to Atlanta Georgia where he died. 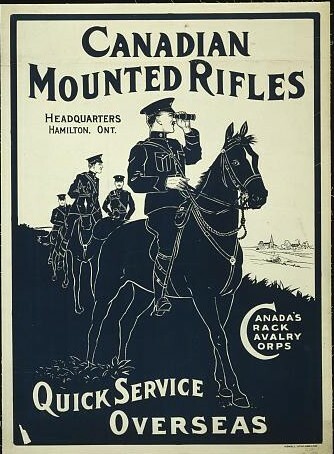 The photos of Captain Begin were small and grainy but the fellow on the horse in this poster looks like he posed for this. various Canadian history sites online.